Here’s an unusual couple that don’t seem to have much in common. Mars in Leo is loud, Venus in Virgo is reserved. But they both want a relationship where only the best is available. Read on to find out if they can make it work. Venus in Virgo will not partner with just anyone. This woman knows exactly who she wants. She can be standoffish, but her shyness fades when she meets someone who makes her comfortable. Virgo will quickly figure out all her man’s needs, inside and outside the bedroom. She strives to be the best lover, companion and confidant her partner has ever had. The downside of this drive for perfection is that she is high-strung. Virgo can be critical, zeroing in on her lover’s faults and not backing off. Mars in Leo is boldly confident. He will launch a no-holds-barred pursuit of the woman he is attracted to, showering her with romantic words and fabulous gifts. He can be pushy, but he’s so good-natured that most women don’t mind. A generous, enthusiastic lover, he just wants everyone to enjoy themselves (while appreciating how fabulous he is). He can be loyal and devoted until he senses that he’s being ignored. Then he’ll look around for someone else to appreciate him. 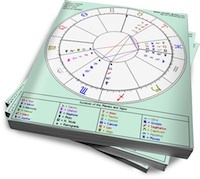 Leo’s displays may initially be a turnoff for Virgo. She likes things understated, so he won’t win her over with gifts. What will work is Mars in Leo’s warmth and determination to get past her frosty reserve. He’ll be intrigued by Venus in Virgo’s untouchable vibe and will assume that she’s a prize worth winning. Leo will be thrilled to discover that Virgo caters to his every whim, and Virgo will adore Leo’s appreciation. The trouble will start when Venus in Virgo points out Leo’s imperfections. She may do this lovingly (because everyone can stand some improvement) but Mars in Leo has a low tolerance for this. Nothing cools his ardor faster than suggestions on how he could do something better. For this union to work, Virgo will have to pull back on the criticism and Leo will have to develop a thicker skin. However, both have an instinctive understanding of their complementary roles and they play them to the hilt. With enough self-awareness, these two can fit together like pieces of a puzzle.